Hey Moms! One of our biggest struggles is how to take care of ourselves while taking care of our kids, so today we’re talking to fitness and lifestyle mompreneur Sara Haley on how we can stay fit, healthy and happy as parents. She has a lot of wise advice from her experiences in the mommy trenches… read on to learn seven easy ways you can improve your life, every day. 2. Keep your Bag of Health stocked! If you don’t have one, you need to keep one with you always, so you don’t give in to bad habits just because you weren’t prepared. I keep mine packed by the front door, or just leave it in my car. Having these things on me at all times helps keep me healthy by keeping me hydrated, avoiding evil cravings, and giving me a chance to get a last-minute workout. Add anything that will save you from your normal excuses! 3. Hydrate! I always make sure that both my kids and I stay hydrated. My number one health tip for everyone, but especially moms and moms-to-be, is that when you think you are hungry, you are more than likely just dehydrated, so drink H20 as often as you can! Keep a water bottle on you at all times (like in your Bag of Health). 5. Laugh and smile as often as possible. Smiling is contagious. When you’re having a “mom moment” or better yet, when your kids are having a “kid moment,” SMILE or make them laugh! Tickling is a guaranteed path to laughter at my house. The sound of children’s laughter, especially my own boys’, is music to my ears. It makes me feel like I’m doing my job right. Remember, staying healthy isn’t just about the food we eat and the way we move our bodies, but about how we feel too. 7. Bonus Tip: Let it go! 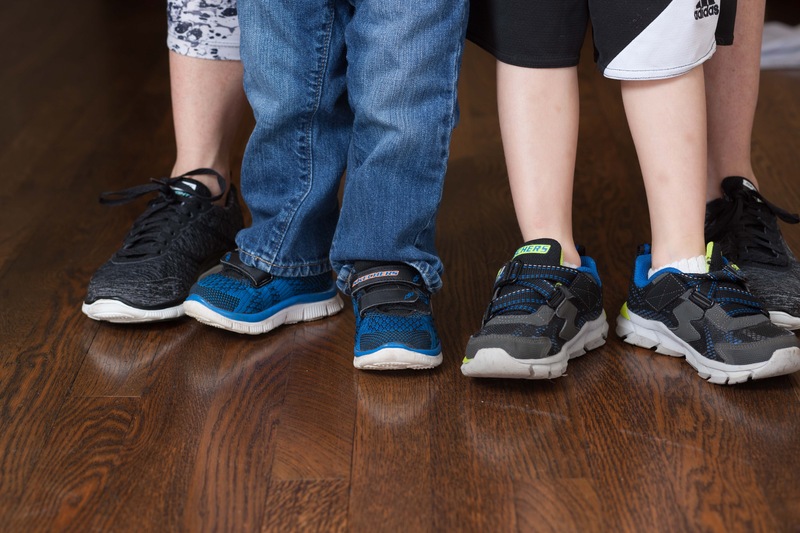 Fellow mamas will understand this one: I was trying to get a pic of me and my boys in our Skechers, but the timing was horrible. Landon (my oldest) had just come home from school and was clearly exhausted and not into it. I thought about it and said to myself, “Sara, just let it go. It’s not that important.” And let’s be honest, in the scheme of things it wasn’t. So for your mental health, and for your kids, pick your battles and choose sometimes to Let It Go! Thanks for listening! I hope these tips will help you in your quest to be a fit, healthy, and happy mom. Sara Haley is an active mom of two and creator of the Expecting MORE workout series for moms and moms-to-be. Check out her workout programs at SaraHaley.com/shop and chat with her on Facebook, Twitter, Instagram, Snapchat or Periscope @sarahaleyfit.